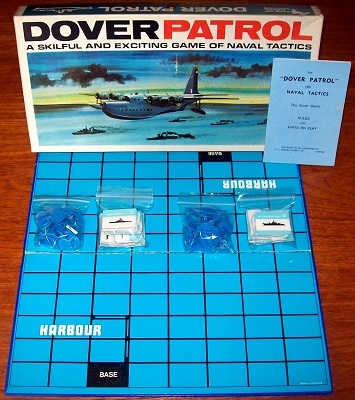 'DOVER PATROL' BOARD GAME: A skilful and exciting game of naval tactics. The object of the game is to seize the Flag of the opposing enemy fleet and convey it to one's own base. The game is complete and in excellent condition throughout. The box, which shows only minor signs of wear, is solidly intact and the picture on the box lid is vibrant and colourful. The game board is in very good condition. Most impressive, however, are the playing pieces and clips. Each one appears unused and presents itself in excellent condition.